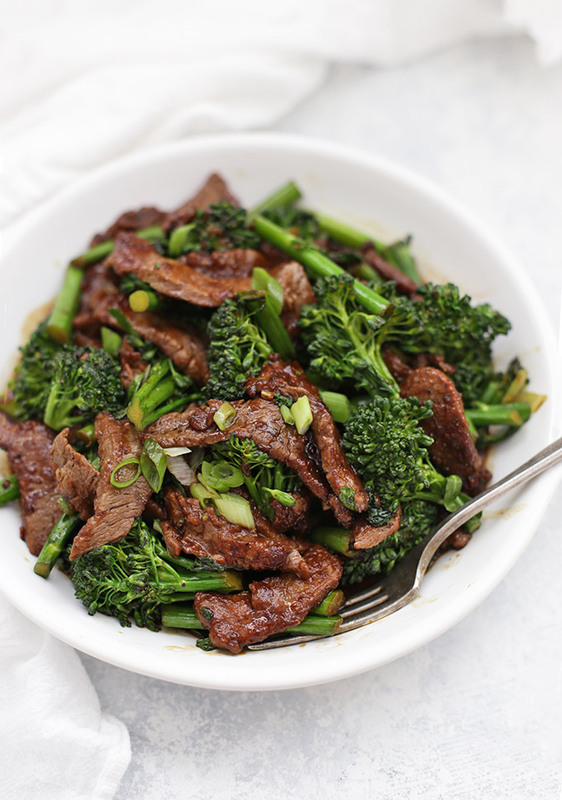 Healthy Beef and Broccoli – This take-out favorite is so easy to make at home and–BONUS–it’s paleo, gluten free, and Whole30 approved! I’ll always have a soft spot for something that takes a bit more time and effort (like slow-simmered soups or stews, or a fancy dessert), but most days we’re eating meals that are fairly straight-forward and simple. That never (EVER!) 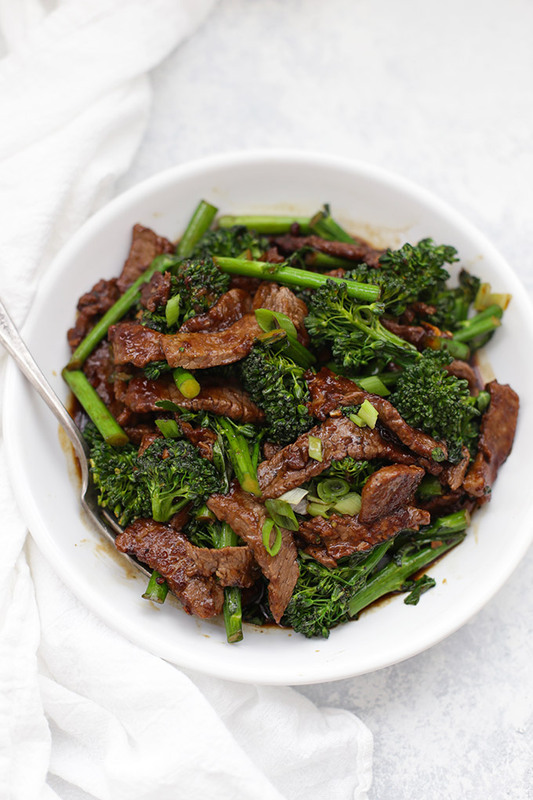 means we sacrifice flavor, and this healthy beef and broccoli is one of those dynamite recipes that hits all my favorite criteria–fast, healthy, easy, and delicious. Thinly sliced beef gets dredged in a little bit of arrowroot (or cornstarch, if you’re not paleo/don’t have it), and a super-quick sear in the pan. Paired with tender, delicious broccolini (or broccoli), and a three-ingredient sauce, the flavor combination is magic. I love when I can coax as much flavor as possible out of a short ingredient list. 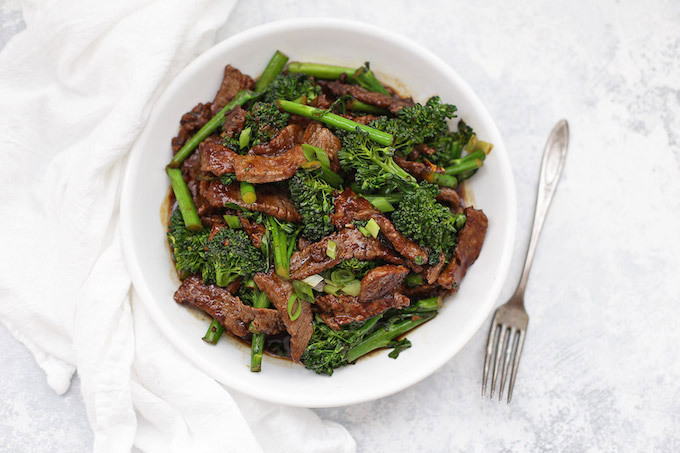 The beef stays tender, the broccolini is cooked just enough, and the savory sauce ties everything together. Serve this with a side of fresh pineapple, and some rice or cauliflower rice, and dinner is done! Go low sodium. Whether you use soy sauce, tamari, etc. I always suggest using low sodium sauce. If you use regular soy sauce/tamari, it can get too salty. If you can’t find low-sodium sauce, you can add less soy/tamari, or add a little more water to dilute it a bit. (I haven’t found this to be a problem with coconut aminos.) Also note that for this to be Whole30 compliant, you will want to stick with coconut aminos.